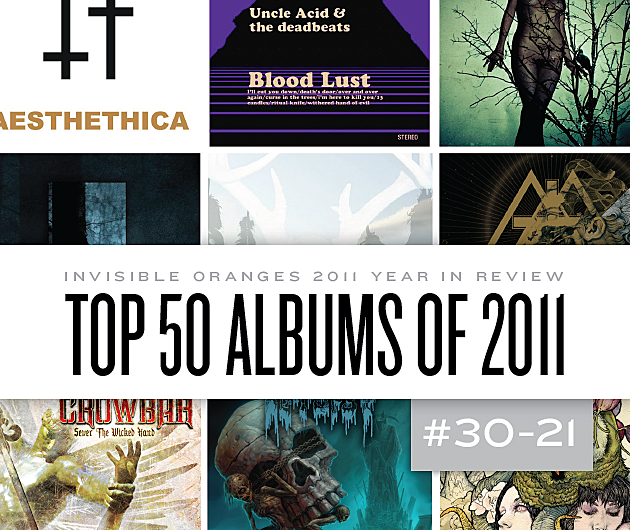 For an explanation of how we determined our Top 50 albums of 2011 (and for a look at albums 75 to 51), see our first post in the series, Top Albums of 2011, 75 to 51. Read the Invisible Oranges review of The Atlas Moth’s An Ache for the Distance. Read the Invisible Oranges review of Blut Aus Nord’s 777: Sect(s). Read the Invisible Oranges review of Crowbar’s Sever the Wicked Hand. Read the Invisible Oranges review of Seidr’s For Winter Fire. Read the Invisible Oranges review of Uncle Acid & The Deadbeats’s Blood Lust.